The video covered today is “Eczema: Bleach Bath Therapy”. For this video, I interviewed Dr Lawrence F. Eichenfield, M.D., who is the Chief of Pediatric and Adolescent Dermatology of Rady’s Pediatric Eczema Center, and Professor of Pediatrics and Medicine (Dermatology), at the University of California, San Diego (UCSD) School of Medicine. Dr. Eichenfield’s clinical interests include atopic dermatitis, and serves on the editorial boards of several journals and periodicals, and is Co-Editor in Chief of Pediatric Dermatology. Bleach bath is useful for children whose eczema is frequently infected. Always ask the dermatologist before starting on bleach bath therapy. Infected eczema can appear as unusual oozing or honey-colored crusting. It can occasionally show as pus bumps, or as tender, red, warm skin. Inflammation can also appear red, as well as “rashy” and scaly. The bleach baths are usually recommended for children who have problems with skin infections, rather than just the inflammation seen with simple eczema flares. Bacteria multiply exponentially, so when its population is temporarily decreased, as after the use of hand cleanser, it re-grows quite quickly and returns to its normal concentration. MarcieMom: We know that the main benefit of bleach bath is to reduce the harmful bacteria, in particular, staphylococcus aureus that often colonizes eczema skin and promotes skin inflammation. MarcieMom: Will reducing staph bacteria via a bleach bath be only effective for a short time and the harmful bacteria quickly proliferate after the bath? Dr Lawrence: Bleach baths appear to decrease the quantity of bacteria on the skin, probably transiently. There have also been some studies to show that hypochlorous solution, the active ingredient in bleach bath, may have anti-inflammatory effect. We don’t really “wipe out” bacteria on the skin with bleach bath, but only tame it down for a period of time. However, they have been shown very useful as part of therapy in eczema that gets frequently infected. MarcieMom: It is mentioned in the video to consult the doctor before starting on bleach bath therapy. 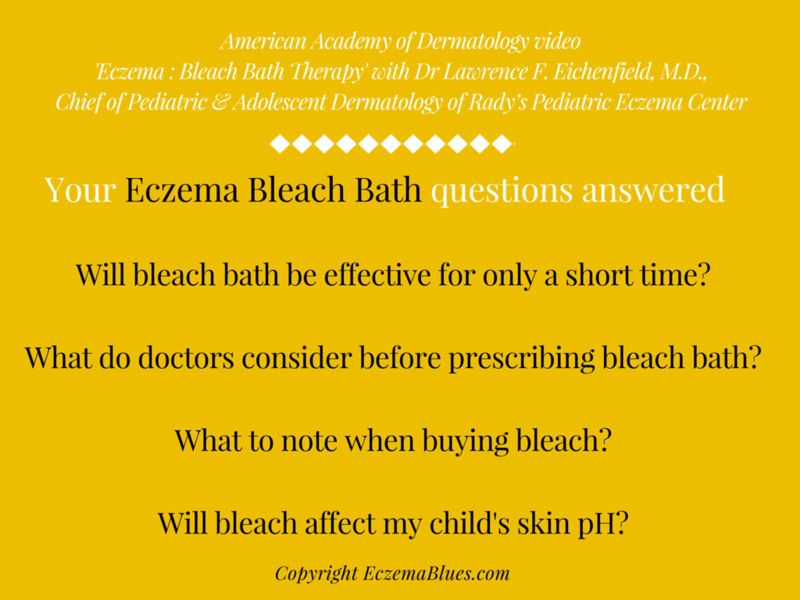 What are the factors that a doctor will consider when deciding whether bleach bath is a suitable (or not suitable) treatment for a child with eczema? Dr Lawrence: When considering bleach bath, doctors will usually consider the overall degree of eczema, the tendency to have secondary infection, which can present as honey-colored crusting, as well as the age of the child. Bleach baths, while very useful, are usually therapy used in addition to regimens of moisturizing and topical anti-inflammatory therapies, as “add-on” for more difficult eczema to manage. MarcieMom: In the video, we saw that household bleach is used for the bleach bath and we should check that there is no more than 6% sodium hypochlorite in the bleach. I realized that many household products (including bleach) do not label their contents (not mandatory requirement in every country) and that many bleach products have fragrance. MarcieMom: What is your suggestion on how to get the right bleach product? In the event that parents can’t find a bleach product that is fragrance-free with clear labeling, what is the alternative product? Dr Lawrence: You are correct to bring up the issue that there is variability in concentrations of bleach bath, as well as bleach not being available in all countries. Also, we have become aware that there are more concentrated forms of bleach being sold to decrease shelf space in grocery stores. Parents need to take a look at the percentage of sodium hydrochlorite, and if there are using a more concentrated version adjust the formula. There are commercial alternatives, including some readily available non-prescription products that have sodium hypochlorite solution as their active ingredient. For instance, CLn body wash, marketed by TopMD that offered this product through their website or Amazon.com. This product has had several studies that have shown benefits in pediatric atopic dermatitis. MarcieMom: Staph bacteria is the cause of many other skin infections such as cellulitis, impetigo, folliculitis and staphylococcal scalded skin syndrome. Using bleach bath can be preventive, so that there is less likelihood of an infection. It is better than treating an infection using antibiotics that may lead to antibiotic resistance. However, a bleach bath can be drying for the skin since bleach has a pH level of 11 to 13, thus considerably alkaline. Alkaline products can also lead to reduction of ceramide-producing enzymes, decreased skin lipid production and dry skin. MarcieMom: Is there a way to adjust the skin pH after the bleach bath? For instance, will rinsing off residual bleach bath water be useful or will it decrease the effects of the bleach bath? Dr Lawrence: When using bleach bath, it is important to handle the skin as with regular baths, with use of emollients/moisturizers after bathing. Some experts will rinse off the residual bleach bath water, while others will leave it on the skin. In studies, it does not appear to make a significant difference, though experts do vary in their suggestions. Certainly application of moisturizers will help, and in any case, the application of moisturizers after bathing will help to improve the skin function, including recovering the pH to normal level. Thank you Dr Lawrence for helping us to increase our understanding of the bleach bath and clarify questions and reservations we parents have.